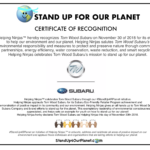 Helping Ninjas™ new initiative “Stand Up For Our Planet” is to applaud those individuals and businesses that put forth effort to help our planet and each other. Our mission is bring awareness to those that are helping and to celebrate their efforts. 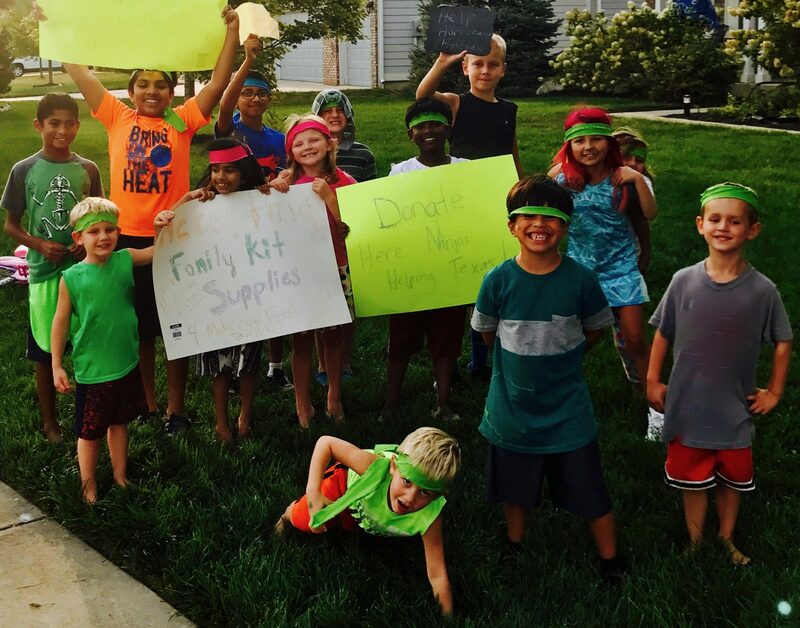 Helping Ninjas believes it is best to lead by example and it is important that we teach our youth to recognize and thank those persons or indviduals, organizations and coprorations, who are helping our planet is some way – big or small. Stand Up For Our Planet initiative is led by youth, a mission to learn to inspire others to celebrate any and all efforts by others whom are protecting our home and future. #StandUp4OurPlanet will educate, address and celebrate all areas of positive impact on our environment. Helping Ninjas™ @standup4Rplanet initiative can be found on social media. This is an outlet in which anyone may join and participate in our efforts to educate youth on how to help our planet. Inspiring unity, help and change. Helping Ninjas encourages others to tag posts @standup4RPlanet! Tag posts, videos, photos, etc… depicting how any organization or business is helping the planet! Rather than singling out those who are not, let us help educate our youth about those who are helping our planet, and lead our youth in a public expression of gratitude. Efforts to help others in need, learning to help yourself and help the planet, helping the environment such as recycle, composting, reducing waste, conserving energy and/or supporting renewable energy; such as photos of Eco-Friendly Straws, Eco-Friendly Utensils, To-Go Boxes, etc. Promoting urban farming, such as buying local, or any sustainable environment efforts or goals. Community Outreach and/or charitable acts of helping the community or planet. Helping NInjas gives the companies who make these producuts a Helping Ninja High Five! Thank you for making these products available, and helping the planet! Any other organizations and business efforts to help the environment –is worth sharing. Any celerity or athletes efforts to help. Any effort or education on how to help living things — including all species of life, pollinators, butterflies, land & aquatic animals and wildlife, soil, water, air, weather — any news story, news feed, post or photo you may have seen – and could be a share learning tool for others. Our mission is bring awareness to those that are helping and to celebrate their efforts. For example, included in the global issues this mission addresses in hopes to educate the community and inspire a to help is: food waste, hunger and food rescue – and repurposing. And it’s connection. 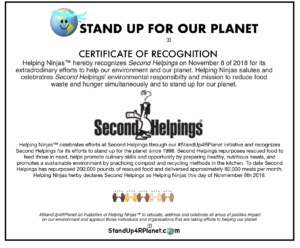 Helping Ninjas™ #StandUp4rPlanet celebrates efforts at Second Helpings, whom is recognized for its efforts to stand up for the planet; Second Helpings repurposes rescued food to feed those in need, helps promote culinary skills and opportunity by preparing healthy, nutritious meals, and promotes a sustainable environment by practicing compost and recycling methods in the kitchen. Learn Help Share®Learning is helping. And you can help others by sharing what you have learned. Join the Helping Ninjas moevment by sharing inspiring and educational posts @StandUp4RPlanet and begin helping the planet today! Learn Help Share Post examples to tag #StandUp4RPlanet, or #HelpingNinjas would be a picture of how you a business i helping the planet, or how you are helping the environment, a cool photo someone has taking depicting others helping, or just nature in general – anything that helps are planet is worth sharing. Do you know someone who is standing up for our planet? Please share with us! You can send via email or share on social media! Want to learn more about food rescue? StandUp4RPlanet Learn more about stand up for our planet initiative.